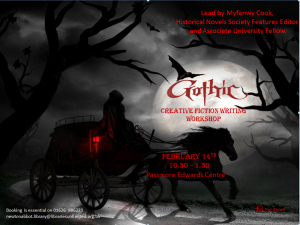 A Valentine’s Day Gothic Fiction Writing Workshop in Newton Abbot. Myfanwy is an ‘eclectic’ writer who is fascinated with experimenting with words and their potential enlightening power. She writes short stories, because they are like health food bars. They are small, satisfying and packed with intense power and energy producing ideas. They can also be fitted around the often mentally or physically draining routine of work.